ขอโทษ /kăw-tôot/ is used when you want to apologise to someone or used for the phrase ‘excuse me’ when you want to ask someone to make way for you. เสียใจ /sǐa-jai/ means ‘sad, sorry, regret‘. We say “เสียใจด้วยนะ sǐa-jai dûai ná” when we want to express sympathy such as when your friend’s dog died or when you hear about someone’s broken relationship. From our teaching experience most students make a mistake by using the phrase “ขอโทษ /kăw-tôot/” for ‘I’m sorry’ and ‘I’m sorry to hear that’. 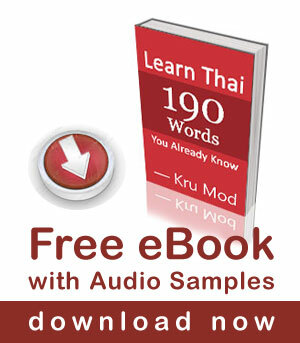 Now you know that we have two different phrases and you are one more step closer to speak like a Thai! Interested in having private Thai lessons via Skype with us, schedule a free trial lesson at adjima_t@hotmail.com or find further details via the link here. Sorry, please delete this comment. It is for Ep. 1 (“WHEN”). I duplicated it there. in a french / thaï method, I’ve heard a phrase saying “Koh tang noy” Do you also use it to get the way to where you’re going to? You understood it correctly. It is literally translated to “Can I have a way please?”. Hi. Its not often i can say this, in fact i have never been able to say it but i did know this one, but it is still good to be reminded of it. I am coming out to Thailand shortly and i have got to get alot of practice in so i will definately slot the above one in. Your videos and content are excellent. It makes learning Thai a little easier when I can see that the teachers are also having fun. I have one question – when I want to say excuse me to pass people on the busy BTS trains, do I say kaw toht or kaw a pai ? I wish I had have found your site sooner. Thank you for your comment. You would say “ขอโทษ kaw-tote” anytime you wan to say “excuse me”. “ขออภัย kăw-à-pai” is too formal, we don’t use it in everyday life.